This only applies for suspected snakebite (in Australia). The CSL Snake Venom Detection Kit (SVDK) is produced specifically to identify the presence and type of Australian snake venom. It is very practical in design, giving results which relate directly to the most appropriate antivenom to use.The best sample for testing is a swab from the bite site and it can detect nanogram quantities of venom. Even a bite site that has been washed may yield a positive result. If the patient already has systemic envenoming, then venom may be present in the urine and this is then a useful alternative for sampling. Unfortunately, because of non specific binding with plasma proteins, blood is not a reliable sample and is only recommended if a bite site swab or urine is unavailable. If a blood sample is used, the snake venom detection kit product information should be carefully read before proceeding. If a dead snake is available, a swab from the fangs may yield a positive result, if a bite site is not available, but beware finger prick envenoming from the fangs. Everything needed to perform a SVDK is provided in the kit, with the following exceptions. The kit does not provide a source of running water for the washing phase, nor a container for waste. If the kit is to be used in transit in a medical retrieval plane or ambulance, then also carry a squeeze bottle of water for washing and a waste liquid container. Each SVDK box contains three test kits and three sample bottles, but the substrate reagents and sample well holder are common to all 3 test kits.  Locate the bite site (cut off bandage over the bite site only to gain access, if there is first aid in place). Make sure no-one washes it! Alternatively, if there is clearly systemic envenoming and the bite site is of poor quality, test urine.  Take one of the cotton bud swab sticks provided in the kit and an unused "Yellow Sample Diluent" bottle. Unscrew the cap off the bottle, revealing the dropper cap. Lever this off, using a finger nail and put it to one side.  Put the swab stick into the sample diluent fluid to thoroughly moisten it.  Rotate and rub the moistened swab stick vigorously over the bite site and adjacent skin, to pick up venom on the skin around the bite and from just beneath the surface of the bite marks.  Place the swab stick back in the "Sample Diluent" bottle and twirl it around, to get any venom off into solution, then remove the swab stick and replace the dropper cap. You are now ready to start the test procedure.  Open a pack containing test wells (silver like pack), remove the enclosed set of 8 joined wells and place them in the holder. There is a lug at one end to enable easy placement in the right orientation. Remove the cover from the wells. 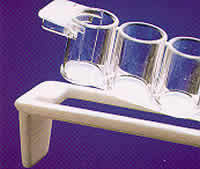  Place 2 drops of the sample diluent you have prepared into each well.  Leave to stand for 10 minutes.  Gently wash all wells under gently running water 7 times (blood is not a recommended sample in envenomed humans but if used requires at least 15 washings), then invert and gently shake out excess water (don't try and dry the inside of the wells with anything).  Now add the 2 substrate reagents, one drop to each well of the "Peroxide" and the "Chromogen".  Allow to incubate for 10 minutes, watching the whole time, against a white background, for colour change. It is vital to observe the kit throughout this final phase, as the time sequence of colour change may be crucial.  There should be a blue colour develop in well 7 (positive control), usually within 2-3 minutes. There should be no colour change in well 6 (negative control). A colour change in any of wells 1 to 5 indicates the presence of snake venom. 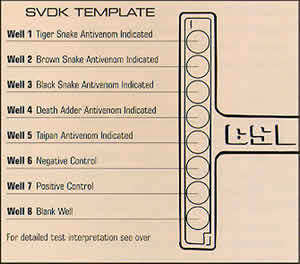 The number of the well changing colour first indicates the type of snake venom and corresponding CSL snake antivenom. If there is no snake venom detected, then wells 1 to 5 will not change colour.  Once the kit has been read, remember to put common reagent tubes, the white well holder, instructions, unused swab sticks and well packets back in the box and then put this back in the fridge. The reagents may quickly deteriorate if left out at room temperature too long! Interpretation of the SVDK is often simple. Always remember that a positive result for venom from the bite site does not mean the patient has been significantly envenomed. A positive SVDK from the bite site is not an indication to give antivenom. It is an indication of the type of antivenom to give if, on clinical or laboratory grounds, the patient needs antivenom therapy.  Well 6 must not change colour and well 7 must change to blue for the test to be valid.  If wells 1 to 5 show no colour change, then no venom has been detected. Only well 7 positive: No snake venom detected. This result does not exclude snakebite.  If well 1 changes to blue first, then the patient has been bitten by either a tiger snake or rough scaled snake, or possibly a copperhead, broad-headed snake or Stephen's banded snake. Envenoming from all these snakes respond to CSL Tiger Snake Antivenom. Wells 7 & 1 positive: If systemic effects include defibrination, paralysis ± myolysis, suggests tiger snake or rough scaled snake bite. If systemic effects defibrination only, consider bite by broad-headed, pale-headed or Stephen's banded snake. If systemic effects are confined to paralysis, without defibrination, consider possibility of copperhead bite.  If well 2 changes to blue first, then the patient has been bitten by a brown snake. CSL Brown Snake Antivenom will then be the right choice. Wells 7 & 2 positive: Most likely a brown snake bite. If systemic envenoming develops, expect defibrination coagulopathy, ± renal damage. Paralysis is unlikely and myolysis should not occur.  If well 3 changes to blue first, then the patient has been bitten by a mulga snake (king brown), red bellied black snake, spotted black snake or Collett's snake. All these respond to CSL Black Snake Antivenom, but this is best reserved for bites by the mulga snake and Collett's snake, as all the others respond well to CSL Tiger Snake Antivenom (which is lower volume and cost effective). Wells 7 & 3 positive: Most likely a bite by a mulga snake (king brown) or Collett's snake; if systemic envenoming, expectmyolysis, extensive swelling of bitten limb, ± anticoagulant coagulopathy, ± renal damage, OR possibly a bite by a red-bellied or blue-bellied (spotted) black snake; if systemic envenoming. expect only mild myolysis, no coagulopathy, paralysis or renal damage.  If well 4 changes to blue first, then the patient has been bitten by a death adder, and CSL Death Adder Antivenom will be the most appropriate choice. Wells 7 & 4 positive: Death adder bite; if systemic envenoming, expect post-synaptic paralysis, no coagulopathy, significant myolysis or renal damage.  If well 5 changes to blue first, then the patient has been bitten by a taipan or inland taipan, and CSL Taipan Antivenom or CSL Polyvalent Antivenom is the appropriate choice. Wells 7 & 5 positive: Taipan or inland taipan bite; systemic envenoming very likely. Expect defibrination coagulopathy, paralysis, ± myolysis, ± renal damage.  If wells 1 and 3 change to blue at the same time, then the patient has been bitten by either a copperhead, a red bellied black snake, a spotted black snake or possibly a Collett's snake. CSL Tiger Snake Antivenom is the appropriate choice, except for Collett's snake where CSL Black Snake Antivenom is preferable. Wells 7, 1 & 3 positive: This pattern is sometimes seen with bites by several species. If a copperhead bite, if there is systemic envenoming, expect paralysis, without coagulopathy. If a red-bellied or blue-bellied (spotted) black snake bite, if there is systemic envenoming, expect only mild myolysis, no coagulopathy, paralysis or renal damage. If a Collett's snake bite, if there is systemic envenoming, expect myolysis, possibly anticoagulant coagulopathy, ± renal damage. No wells positive: Indicates kit failure. Re-test with a new kit. Note: 1. Sea snake venoms are not reliably detected by the SVDK. 2. Some other species of venomous Australian land snakes, not known to cause medically significant envenoming, may occasionally give a positive SVDK result. Notable examples of this phenomenon are the whip snakes. Remember, a positive SVDK result does NOT mean the patient requires antivenom.